Bring a 4-6 quart pot of water up to a boil. 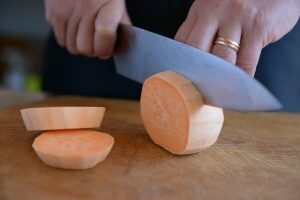 As you wait, slice sweet potatoes into 1 inch thick rings. Drop the potato discs into the boiling water and cover. Boil for about 8 minutes. Remove one of the smaller rings to test for tenderness at its center. Note: You do not want these potatoes to be cooked all the way through. Rather you are looking for firm potatoes with a little give. There is a short window you’re trying to isolate. At 8 minutes, the smallest potatoes should be done. At 10, they should all be done. 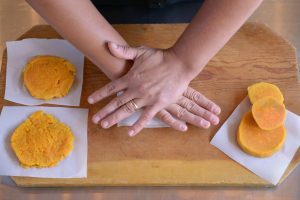 Transfer sweet potato discs to a baking sheet in a single layer without overlapping. Once they are cool enough to handle, press them between two sheets of parchment paper or foil. If they are overcooked, the discs will break apart. If they are in that perfect window, they will give slightly and smoosh out around the edges. You are looking for something that is only slightly thinner than what you started with, maybe 2/3 of an inch after smooshing. Refrigerate the discs till you’re ready to fry them. Cold discs will hold up better when dropped into the oil. In a 10-inch saute pan or skillet, fry the bacon until almost crispy. Set aside and pour off (and save) all but 2 tablespoons of bacon fat. Add the ginger to the bacon fat and let sizzle for about 30 seconds. Add the 5 spice and toast until fragrant, about 15 seconds. Stir in the maple syrup and bring to a boil. Let the syrup cook down for about 8 minutes. It should reduce by 1/3 and thicken slightly. 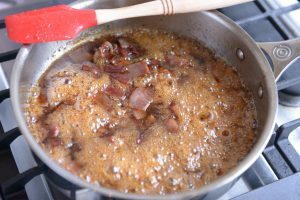 Stir in the bacon and the lemon juice. Bring it back to a simmer just before serving. In a 12-inch heavy bottomed skillet, heat oil over medium heat. 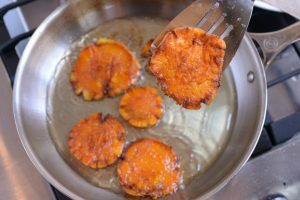 Pinch off a tiny bit of sweet potatoes and drop it in the oil. If it starts sizzling immediately, go ahead and gently place the discs in the oil. Do not crowd them and make sure they are in a single layer. 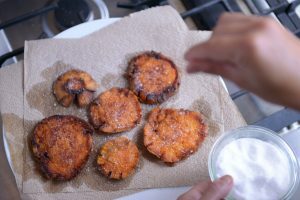 Fry until the cracks and crevices on the bottom are a caramelized, crispy brown, about 6 minutes. Gently flip the potatoes over and do the same on the other side. When both sides are browned, drain the discs on paper towels and season both sides with salt. 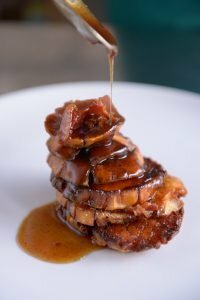 To serve, stack the sweet potatoes on top of one another and spoon the bacon syrup over top. Serve like hotcakes.